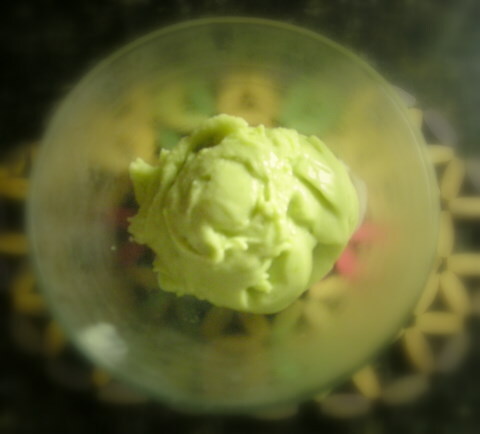 La Gringa's Avocado Gelato .... and a vegan version! Before you say "bleeeeech! ", please hear me out. I have to admit that the first time I heard of Avocado Ice Cream (on the Martha Stewart show 10 or 12 years ago as a matter of fact), I didn't think I would ever try it. I thought that it couldn't be terrible if Martha liked it, but, you know, when there's chocolate, coffee, mango, pineapple, papaya, Cherry Garcia, Coffee Heath Bar, and on and on and on, who needs avocado ice cream? In my search for gelato recipes (Italian ice cream), Avocado Gelato popped up more often than you would imagine. When I saw Avocado-Coconut and vegan versions, I knew that I had to try it. It had everything some of my readers had been clamoring for: definitely an unusual flavor, lower fat (no cream), no eggs (raw or otherwise), lower or no cholesterol, good fat (avocado and possibly coconut), dairy free (with coconut or soy milk), and vegan-approved, unless the cruel practice of skinning citrus fruit alive is frowned upon. Wow! Who would know that I could ever be so politically correct? I actually had to try it twice, once with milk (no cream!) and once with coconut milk (no dairy!). The all milk (whole milk) version was more like sherbet. The coconut milk version was more like ice cream, but we liked both. Yes, El Jefe liked it, too! It wouldn't be his first choice, but he wouldn't turn it away. 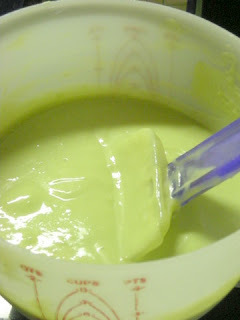 But, if you truly do not like the taste of avocados, I doubt that you will like this ice cream so don't try it. Once again, I reviewed dozens of recipes and the readers' comments on them to come up with this recipe. The recipes that didn't call for citrus juice were commented upon as needing it. 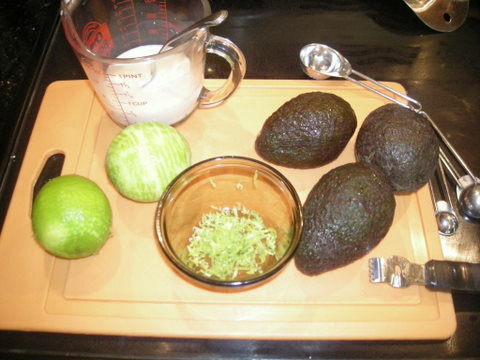 In most of the recipes that called for it, several reviewers felt that the quantities overwhelmed the taste of the avocados. I tried to find a middle ground. I didn't try to expand the recipe for a full 1 1/2 quarts because .... well, truth be told, I wasn't sure if we would like it. Also, I'm a stickler when it comes to avocados — believing that avocados must be eaten within mere hours of being cut. I wasn't sure if the flavor would change over time in the freezer. I asked El Jefe if he could pick up some avocados for me when he went to town. "Are you going to make guacamole?" he happily asked. The response, "No, I'm going to make avocado ice cream", was met with a narrowing of the eyes and a scowl. "You...Are...Kidding. Are you sure?" he whined. "Not at all, but we'll see," I responded. 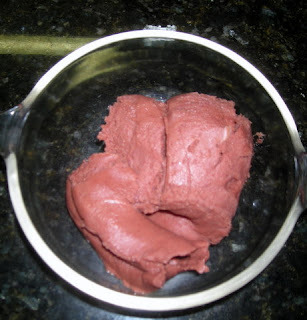 Later on, with Arexy watching me closely in the kitchen, I confessed to her that I was making helado de aguacate. She actually looked frightened, as in: for my mental health, not of the ice cream. ;-D She later tried it and liked it, or so she said, but I have less faith that she would tell me if she didn't. Only the best, freshest, and tastiest avocados should be used. Whatever your avocados taste like, that taste is going to multiplied in the flavor of your ice cream. If they are on the over-ripe side with a bit of a musty flavor, they will be fine for guacamole instead. If they are on the under-ripe side with a bit of a grassy or astringent flavor, best not to use them for ice cream. Instead slice them for a side dish or salad and sprinkle with a little lemon juice and salt. If they have a lot brown areas, throw them out. Which comes first, the avocado or the custard? This is a tough question. 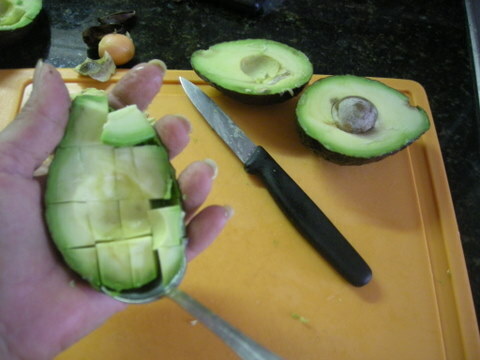 I would never peel and cut my avocados in advance. I'm convinced that most people who do not like avocados have been subjected to less than fresh avocados. But on the other hand, even fresh-looking avocados aren't always what you expected from the outside. What do you do if you've already made the custard and open up your avocados to find disappointment? Here is the solution that I have figured out for you: Buy a backup mango at about the same level of ripeness as your avocados and make mango gelato in case your avocados turn out to be disappointing. Just follow the same recipe, substituting mango puree, but cut back a little on the citrus juice. No mangoes? Use another fruit like peaches or strawberries. Brilliant? 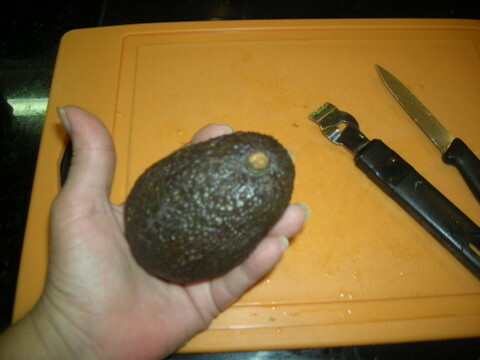 When you buy avocados, look for ones that are still firm, have no soft spots, and still have their 'belly button.' Missing this means they may be past their prime. It's okay if you let them ripen for a day or two or three at room temperature and the belly button pops off when you cut into the avocado. It will be loose in a ripe avocado. The problem with it being already missing in the market is that you don't know how long it has been that way. For this recipe, I would suggest using Hass avocados rather than the larger Honduran avocados. Those varieties are generally more watery and tend to have a less intense flavor. The bright yellow ones might also result in a mustard colored gelato which might not be too appetizing. There are exceptions, though. These 'long handled' avocados tasted exactly like Hass, so they would be fine. 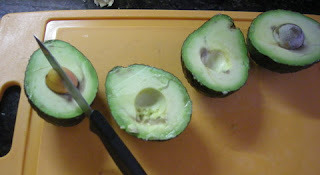 Avocados are messy to cut, so what I normally do is to slice the avocado in half, running my knife along the seed, twisting gently if necessary to pull the halves apart. Then I carefully slam my knife into the pit to remove it. Trying to pull the seed out with your fingers or scoop it out with a spoon can get messy and/or squish up the avocado. I cut the fruit into slices still inside the shell, trying not to cut through the peel. Depending upon whether I want nice, neat slices or smaller chunks, I run the knife crosswise as well through the fruit. Then I take a soup spoon (see photo) run it between the fruit and the shell to carefully scoop out the meat. It's a good idea to turn the pieces over and inspect them to be sure that there aren't any brown areas on the skin side, too. *milk: I used and recommend whole milk. You may try low fat milk for a lower fat version. For a vegan gelato, use canned coconut milk (recommended) or soy milk or a combination. Canned coconut milk adds a lot of creaminess without adding a lot of coconut flavor, and makes a pretty good cream substitute in a pinch. 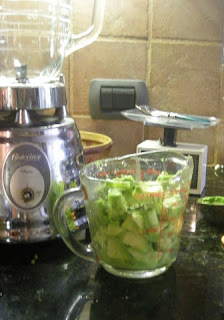 *** My 3 avocados weighed right at a pound and resulted in a little less than 2 cups of cubed fruit. 1. Mix cornstarch with 1/2 cup of milk in a small bowl and set aside. If using soy milk, increase to 3 tbsp. cornstarch. 2. Mix 2 cups of milk, 1/2 cup of sugar, and zest in a 2 qt. saucepan. Over moderate heat, bring to a simmer. 3. 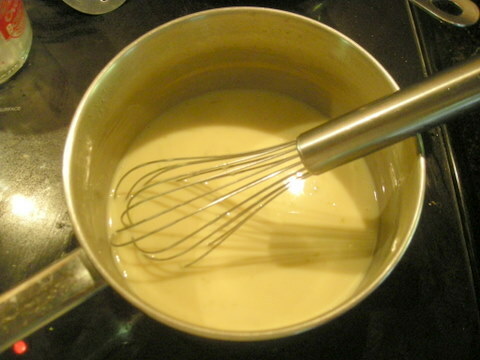 Stir the cornstarch mixture again and pour into hot mixture, whisking constantly to prevent lumps from forming. Bring just to a boil, continuing to whisk constantly, and cook for another minute or two until thick. The mixture didn't appear as thick as the mocha gelato I made using this method, but it passed the back of the spoon test. 4. Put pan into an ice bath to cool quickly, stirring constantly. When cool, put in refrigerator while you prepare the avocados. 5. Cut, pit, and peel the avocados removing any brown spots. You should have about 1 1/2 to 2 cups of avocado chunks. 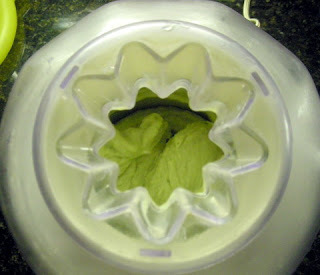 Purée in blender with juice, salt, 1/2 cup sugar, and vanilla until smooth. 6. 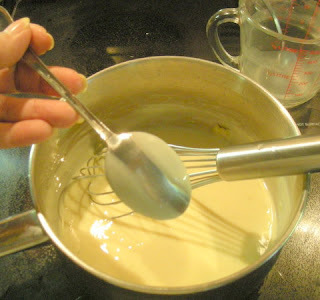 Add cooled milk mixture and quickly blend well. Don't blend too long as you don't want to add too much air to the mix. 7. Chill mixture in freezer, stirring occasionally, for 1-2 hours. When mixture is 35-40F (2-4C), stir well to ensure there are no icy particles and freeze according to your machine's directions. 8. Serve with a small wedge of lime (or lemon or orange) for squeezing over the ice cream. This poor little guy couldn't find his way out of my house. I left the window open for him and eventually he did. He was about 8 feet up the wall. 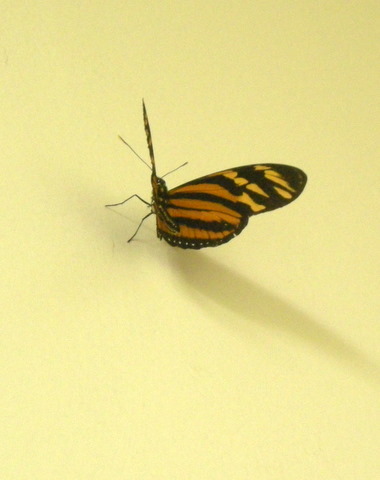 I originally thought it was a Monarch, but upon enlarging the photos, I didn't think so after all. 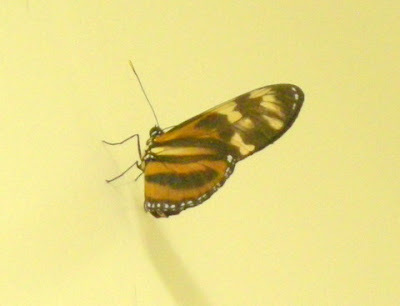 I think it is a Lycorea cleobaea (or L. halia), common names Tiger Mimic-Queen or Large Tiger. 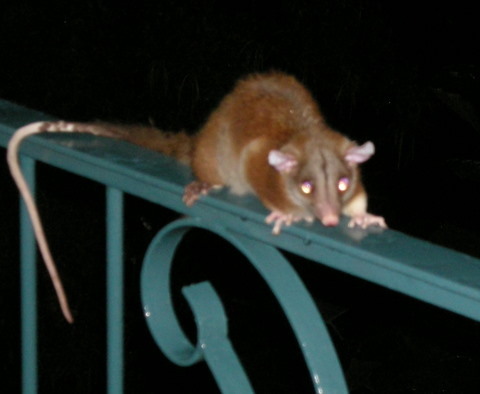 They are attracted to papaya trees. 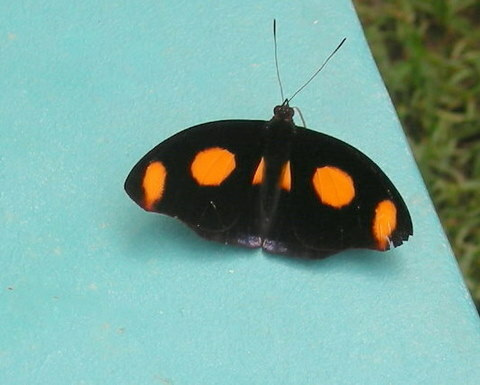 If you are interested in identifying the butterflies that you see, Discover Life has a great page where you input the colors and distinctive markings and it gives you a list of possibilities. I was able to find this one in two minutes. Sorry for shoddy TV photos! Wow! Comayagua had its first recycling marathon and collected — literally! — mountains of recycled plastic and aluminum cans. What fabulous results! Hopefully people will be impressed with the amount of trash saved from the streets, streams, and landfills and will continue the project. 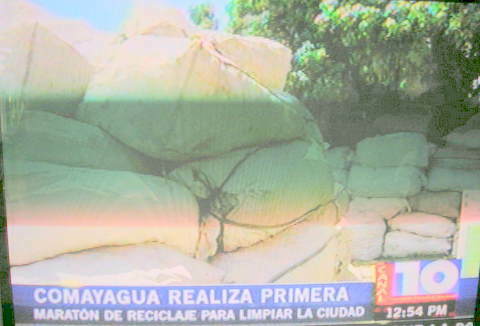 Honduras has a tremendous problem with overflowing landfills. Here in La Ceiba, the landfill has been reported to be on the verge of full for years and the city has had no money to buy property for a new location. The current dump overflows to the community below — Los Laureles, which you can find out more about at Matthew's blog, Here I Raise my Ebenezer. Matthew is a young Mennonite man who works with the people of Los Laureles. The culture of recycling has not really developed among the population in general in Honduras. A few of the very poor make their meager living by scavenging recyclables from the dumps and selling them to consolidators. Some, including children, even live at the dumps among the filth and stench because they have no place else to live and no other way of making a living. 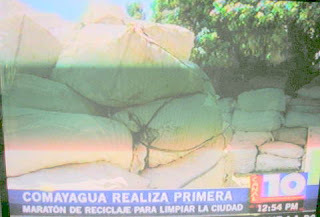 Recycling may seem a trivial issue compared to the more serious problems of Honduras. But I think there is a lot to said for pride in your community. That can lead to other good things, or so says the "broken window theory". Recycling can also be a means of making or augmenting a living, and maybe even the start of new businesses, certainly good things for Honduras. If you are wondering what you can do to recycle in Honduras, all I can tell you is what we do in La Ceiba. We wash and store our recyclable plastic in large bags, one for metal and one for plastic. It takes no time at all to do that and if water is a concern, you can always rinse them with your dirty dishwater. In the past, when the bags were full, we put them out separately for the trash collectors, who were very grateful because they didn't have to dig through our trash looking for recyclables and could make a little extra money from them. Arexy takes our old newspapers every couple of weeks to a relative who uses them to start fires in her wood cooking stove. Now that La Ceiba has a new trash collection system, with brand spanking new trash compactor trucks, I'm not sure if the recycling would go directly into the compactor or not. We haven't talked to them yet, but after reading Matthew's article, we decided that we would drop off the bags when they are full with people in the Los Laureles community. I'm hoping to read an update about the current situation from Matthew (hint, hint). So, if you live in Honduras, ask your trash collector, if you have one, or ask around. You may find that there are efforts to recycle, so with a minimum of effort on your part, you can help the environment and maybe even give a little help to some folks who need it. Roatán has recently started a recycling project which will help the people in the community and help to make a more beautiful, trash-free island. Hooray for them, too. Maybe we'll start seeing more of these community programs in the future. If you are 'crafty' and looking for a more creative way to recycle, check out my crocheted plastic bag articles. I have recycled literally thousands and thousands of plastic bags! Speaking of that, I have lots of new photos to show you. I think you'll be amazed at what the lowly, much-maligned plastic bag can be turned into. 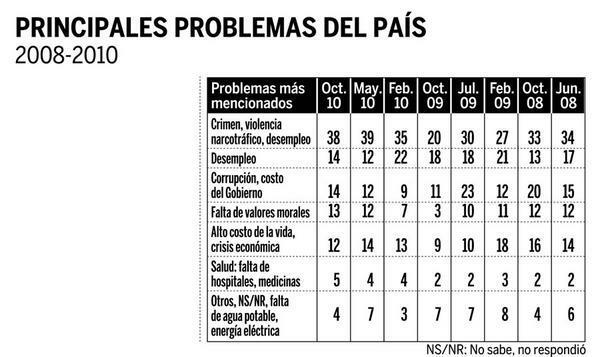 The respected international firm CID-Gallup performed a poll in Honduras recently with results that echo what I and most of my Hondurans friends have been saying: This government is on the wrong track. 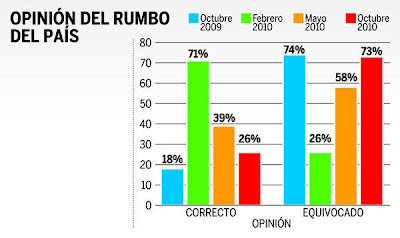 In February 2010, at the beginning of Pepe Lobo's term, 71% of those polled believed that the country was on the correct track. In October 2010, a mere 9 months into his term, the position is reversed, with a whopping 73% believing that the country is on the wrong path and only 26% believing it is headed in the right direction. "En diez meses, los hondureños han pasado de la euforia en la juramentación de Lobo a la depresión antes de que finalice el año." In ten months, Hondurans have passed from euphoria in the swearing in of Lobo to depression before the end of the year. I was never quite euphoric but I feel this depression! A Honduran friend visited La Ceiba from the US a month or so ago. I asked him how he found La Ceiba this year. He answered something to the effect that everyone seems to be in a big funk. I believe this is because most Hondurans — regardless of which side of the political issue they were on — had their hopes up that there would be at least the beginnings of real change. We, at least those naive among us, thought that surely with the world eyes upon Honduras, it could not go back to business as usual. But we just are not seeing any significant changes. It's politics, incompetence, and corruption as usual everywhere, while at the same time, everyone claims all of their actions are on behalf of the poor. 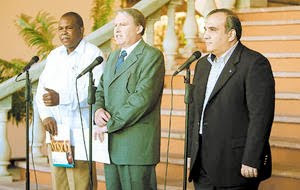 Evaluations of Porfirio Lobo at 9 months into his term compare unfavorably with the last three elected presidents of Honduras at approximately the same point in their terms. His favorable index (the number of good and very good ratings less the number of bad and very bad ratings) is 5, compared to Mel Zelaya with a favorable rating of 28 (2006), Ricardo Maduro 18 (2002), and Carlos Flores 34 (1998). To be fair, in some respects Lobo is a victim of bad economic times, a bad political climate, and huge pressures like never before from groups both within and outside of Honduras. But he has been in politics long enough to know that no one can make everyone happy. Unfortunately, the priorities of Lobo's administration seem to be political rather than in the areas where most people in Honduras would like to see them: crime, jobs, corruption; the things that affect the daily life of the people of Honduras and have been at the top of the list of concerns in Honduras for as long as I've been here. 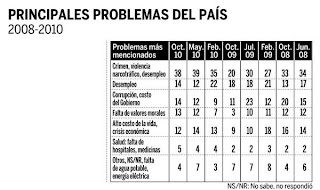 Although two in five of the respondents say that they have gone hungry at least once in the past week, concerns about the high cost of living, lack of moral values, lack of health care, electricity, and water, and every other concern of the pollees added together do not reach the level of the concern about crime. When asked about confidence in the institutions of the country, the military came out on top as they usually do, but with only 17% of the polled having much confidence, down from 21% in May. The media came in second with 11% confidence, only 1% above the president. The National Resistance gained only 9% confidence, along with the police and the Supreme Court, barely beating out civic groups and the Congress at 8%. At the bottom of the list were businessmen — 6%, unions — 4%, and political parties in general — 3%. Confidence had dropped in each of the groups which were rated in the May 2010 poll. What dismal results. The saddest part is that I imagine that those in charge of each of these institutions will merely shrug off the results or, at most, increase the propaganda. Of those polled, the distribution among political parties was pretty evenly distributed, 36% indicated a preference for the Nacionalista party (the current party in power in the Congress and the president's party), 32% indicated a preference for the Liberal Party (Micheletti and Zelaya's party), 29% indicated no party preference and 3% indicated other parties (which would be fairly consistent with voting results for the last two presidential elections). 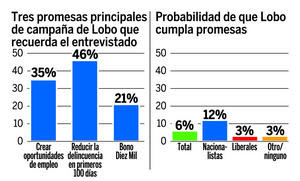 The probability that Lobo will achieve those promises? 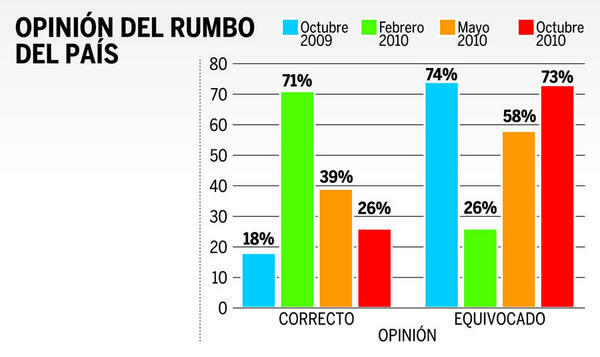 Only 12% of Nacionalistas and 3% of the other categories believe that the promises will be accomplished. The L.10,000 bonus program is a cash payment to poor families to encourage them to keep their children in school, a similar program has supposedly gotten good results in Mexico. Whether or not it will be effective, I imagine that it carried a lot of weight with the voters in poor families. "Let's see. Should I vote for the person who may give me L.10,000 or the person who won't?" The promise that I remember most was during Lobo's inauguration speech in which he firmly announced to the wild cheers of the audience, "No more corruption! Corruptos will go to jail, period!" In reality, several very credible accusations and investigations of corruption in the current administration as well as prior administrations have been put forth and absolutely nothing has been done about any of them. The one result that surprised me the most was that 54% of the pollees believe that Lobo has performed well (47%), or very well (7%) in the area of education. I really can not imagine why people would believe this unless they were remembering various statements that Lobo has made, but not remembering that he didn't follow through on them. Lobo has stated that teachers who don't work will not be paid, but then later made an agreement to pay them. He has stated that teachers and directors will not be allowed to take control of public buildings and prevent school from taking place, but they have and still do. Eighteen district directors were fired after failing a competency test, but after union pressure, they were later returned to their jobs. A pact was signed with the teacher unions to make up the missed days of class on Saturdays, but beginning with the first Saturday, that did not happen in some schools. More recently, we have been told that teachers' salaries will no longer be indexed with the minimum wage — which results in some teachers earning 7 to 11 times the minimum wage (tax-free) and results in a wage burden for which the government just does not have the resources — and that the teacher law — for which many blame the spiraling lack of educational quality in Honduras — may be revised. Time will tell. Teachers were marching in the streets yesterday and have announced an indefinite strike. Teachers represent a lot of voting power. See the complete story and more charts at La Prensa Oct. 27 and Oct. 28), along with many informative reader opinions on the articles. Incidentally, in case you were wondering, this newspaper has Nacionalista leanings. The state of health of people is in great part dependent on what they eat or if they exercise. What they eat and drink also to a great extent is dependent on their knowledge of nutrition, their customs, buying power, and will power. Meals need to be balanced with the proper amount of proteins 30%, carbohydrates 40%' and healthy fats 30%. Carbohydrates should be mostly low density vegetables and fruits and some whole grain products. The proteins should be, low fat meat and dairy products, and fish. 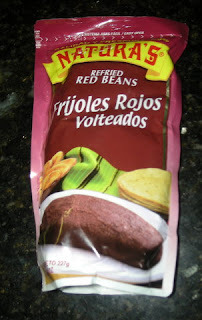 How unfortunate it is that in Honduras, often people do not have enough money to buy healthy food and are enticed by relentless advertising to buy food which is unhealthy, processed, and has a great amount of sodium, chemicals, and sugar to prolong their shelf life and make them taste good. This food is imported from many countries in the world. These food chains do not care about customer's health; it is all about increasing their sales and it is all about money. 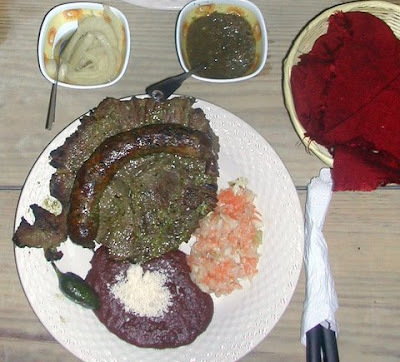 Hondurans are not used to eating vegetables. I notice that people like to eat fried food and also barbecued meat; both are unhealthy. It is much better to buy healthy fresh food which should include a great deal of vegetables and fruits, instead of processed food. 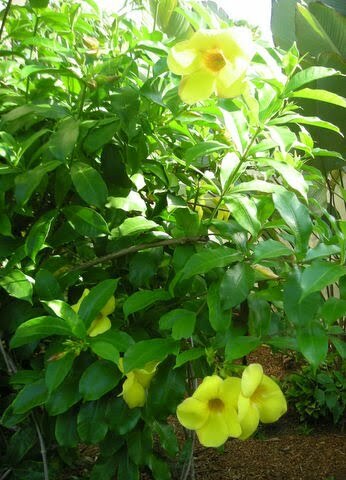 One time I had to wait near a 'pulperia' in the morning and it was sad to see what people buy for breakfast: a bottle of cola and a bag of sweet bread or chips. Some even bought a carton of orange juice which is also not healthy, as it contains many chemicals and sugar. These people do not know the damage they are doing to themselves or perhaps they do not care about it. It is possible to buy 15 to 20 oranges or more for the price of one litter of cola. Chips have a high content of bad fat and other unhealthy ingredients. I see a lot of chips being eaten in Honduras. I know that many working Hondurans have the custom to rely for their lunch on restaurant take-out or a food stand nearby and it takes too much money out of their pay check. How much healthier would it be to prepare at home a big bowl of salad with tomatoes, green pepper, onions, etc. with a tablespoon of olive oil and apple or balsamic vinegar, accompanied with a piece of chicken or low fat cheese or fish, no more than two tortillas and perhaps a piece of corn. Always eat a piece of fruit or banana after lunch. Drink water, pure fruit juice, or green tea instead of cola or similar sugary drinks. We all know already that almost all food served in fast food outlets is unhealthy. The upper and middle class have absolutely no excuse not to eat healthy and should eat more unprocessed vegetables and fruits. The fact that there are many people overweight is proof that they do not eat correctly and do not exercise. I think Hondurans are addicted to cola and soda drinks. It will take a great effort to live healthy so that they become less dependent on drugs and medical services. Many healthy foods are grown in Honduras. If people insist on drinking colas and eating chips or other processed foods, they will get sick sooner or later. It makes me sad to see people lining up in drug stores to buy medicines for high blood pressure or high cholesterol. In most cases, all they need to do is to change their lifestyle by eating differently and exercising. It is much faster and convenient for medical doctors to write out a prescription than to explain how to eat different foods and exercise. Unfortunately these days, medical doctors have been mostly trained to relieve the symptoms, rather than to work towards prevention of illnesses, and many people think there is pill or a surgery for all sicknesses. Honduras is not able to provide good health care to people who cannot afford private health care. Like in many other countries, Honduras would not have to spend enormous amounts of money on health care if the emphasis would be on prevention rather than on the treatment of sicknesses. As the old saying goes, "An ounce of prevention is worth more than a pound of cure". Lack of prevention drains the amount of resources which would be better spent on infrastructure, school and factories. People who eat healthy food and exercise and are very moderate with alcohol consumption, (one glass of wine or equivalent a day, for woman and two for a man is recommended) and do not smoke, will rarely ever become sick. Also, of course, exercise is important. You must walk thirty minutes or, better still, one hour everyday and do some weight lifting three times a week if you have the opportunity. It is never too late to start a healthy life style. Why spend a lot of money on medical services, drugs, etc. when all you have to do is eat healthy and exercise? The total amount of money saved in Honduras, by eliminating unnecessary expenses in health care (by changing their lifestyle) can be used for productive purposes, and would go a long way to make Honduras a better and healthier country. This article is by no means comprehensive, but rather is meant to inspire you to get more knowledge by reading a health book and articles about health which can be found by searching the internet. If you stay healthy, you do yourself and Honduras a great favour. About the author: Rudi Kerkmann is a trilingual full-time pensioner married to a bilingual Honduran woman for more than 30 years. They have lived in Honduras part of each year for the past 10 years and feel that they have fully integrated into the life in Honduras. They would love to see a Honduras more educated towards healthier and simple food habits. Rudi invites your comments on his article. While watching cooking shows on television, I often cringe when I see the chef adding water straight from the faucet to some recipe! Then after I recover, I remember that, yes, I used to do that, too. I get a little twinge of remembrance seeing store commercials showing shoppers carrying large shopping bags around the store — that is never allowed in Honduras where all customers are presumed to be shoplifters. That used to bother me, but now I'm used to it. Our cable system includes (at least sometimes) the Denver US network channels. You know how before the news begins they always include a teaser, a shocker to keep you from changing the channel? One night the teaser was that the city had one 6-FOOT TALL WEED growing in front of a municipal building! (It actually looked to me like some sort of wild tree and the grass was neatly mowed around it.) "Why are citizens fined if their property isn't maintained when the city doesn't maintain their own?!!" Oh, horrors! All I have to say is that if that is the worst thing you have to worry about, you are doing okay in Denver. This is the season of car commercials. Oh my God. I am in awe of cars that can show you a movie, tell you where you are and give you directions to someplace else, wake you up if you doze off while driving, and — I can only presume — prepare a snack in the back seat when you are hungry. When did all of this happen? How many people buy cars with all those features? Do most new cars have them? This is also the season of US political commercials. I am so glad that will soon be over. Such hatefulness! Such negativity! It gives democracy a bad name. If all of the candidates are as bad as their opposition says, you shouldn't vote for any of them! That was the La Prensa headline. I will be completely honest with you and tell you that, initially, I thought this article was some sort of Halloween joke. You know, like the announcements that Google makes on April Fool's Day. I read the whole thing, laughing, thinking there would be a humorous punchline at the end. 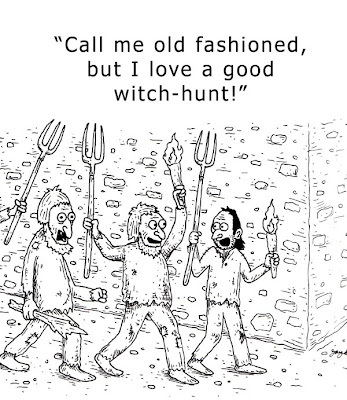 "The government warned yesterday that it will not allow witches into the country who are planning to mount satanic cults in the pagan festival of Halloween. "The Minister of Interior and Population, Africo Madrid, said that mayors and are instructed to cancel any event related to the celebration of satanic festivals or cults. "We're not going to let them into the country. Obviously, such people are charlatans, swindlers who prey on the innocence of people or their beliefs or superstitions. " "I take this opportunity to ask all people, especially Christians, to prevent their children from participating in celebrations that are not part of the Honduran national or cultural traditions, such as the Satanic holiday Halloween. That's not part of our culture or beliefs and traditions of our country. " 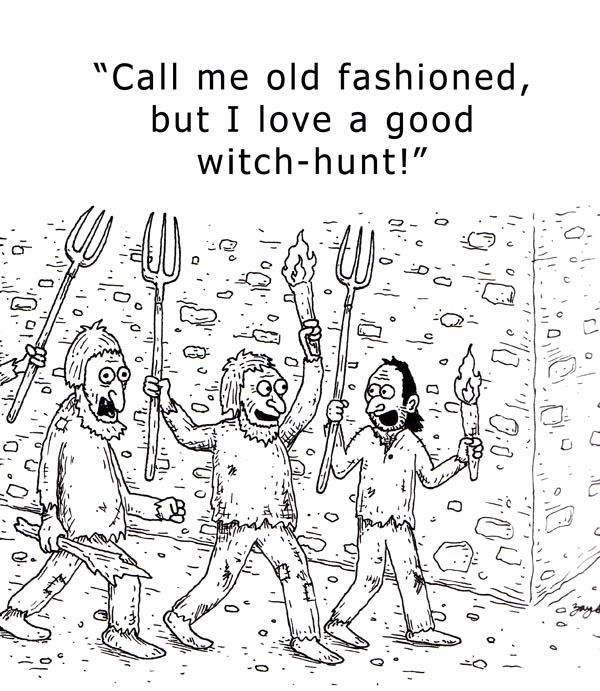 "The issue came under discussion after La Prensa published yesterday that sorcerers from several countries have gathered in the cemetery of Santa Barbara, in western Honduras, for prayer, evil spells and diabolical rituals, according to an employee of the cemetery." Okay. Fine and dandy. There have been some problems in the past with these "Satanic groups" that come to Honduras to mislead and defraud the unsuspecting people selling them potions and 'magic' charms. Which just goes to show you that if good Catholics and good Christians can be tricked by these crazy satanic cult folks, putting constitutional decisions about the future of the country in the hands of these same gullible, easily misled citizens is a risky business. For the record, I think maintaining Honduras' traditional culture and traditions is a good thing, though I think that most of those traditions have been lost long ago in the pursuit of being modernized and Americanized. What about some of these so-called Evangelical cults that mislead and defraud their unsuspecting flocks every day? I've heard of one in La Ceiba that pressures their congregation to tithe their wedding rings if they have nothing else to give. I think these charlatan and swindling pastors are a much bigger threat to the average citizen. And what about innocent Halloween parties that many Honduran private schools hold to teach children about the cultures of other countries? There isn't anything satanic about them, just the silly childish fun of dressing up and eating treats. The article states "The mayors now have clear instructions to cancel, close and seize any article or event with this type of charlatans and con artists and including some religious cults posing as Christian churches but who really cheat the people, so we're going to regulate all of these types of actions, "said Madrid, Minister of the Interior. Apparently, mayors will now have the authority to determine what is satanic and what is not. Just like the old days! So, great! We will be safe from witches and evil Halloween parties this year. And from criminals.....? Yes, please! Let's move forward for a better Honduras. I was lucky enough to catch a photo of this beautiful butterfly, which is apparently Catonephele numilia, common name Grecian Shoemaker, Black Velvet or Spotlight Catone. In trying to identify it, I found photos from southeast Brazil (number 240 on this very long page), Mexico, and a Omaha, Nebraska zoo. A group of 30 US Congressmen sent a letter to Secretary of State Hillary Clinton requesting that all aid to Honduras, particularly military and police aid, be stopped due to the human rights situation in Honduras. Here is a UPI article, U.S. hopes Honduras will come around on human rights. [reporter] QUESTION: Do you have any comment on the letter sent by 30 congressmen to Secretary Clinton requesting a suspension of U.S. aid to the Honduran Government arguing that Honduran authorities carry out human rights violations and their murders of activists and journalists with impunity? MR. CROWLEY: Well, we have received the letter and we will continue our consultations both with the Congress and also within the OAS. MR. CROWLEY: Human rights is a fundamental element of our dialogue with the Honduran Government. There have been incidents where activists have been killed, intimidated, jailed, both going back to the previous government and recently. We expect the Lobo government to investigate these fully and prosecute those who are responsible. Progress on the human rights front is fundamental to the future of Honduras and this is – was one of the core elements of the San Jose Tegucigalpa Accords. The Lobo government has made some progress; more needs to be done. But I think where we disagree with our congressional colleagues is that they conditioned progress on the human rights as a precondition for the return of Honduras to the OAS. We think they go hand in hand – improving the democratic performance of the government is vitally important, but also reintegrating Honduras into the community of democratic nations in this hemisphere is also important. And in fact, the election of the Lobo government was itself a major step forward for Honduras. There was a suggestion in the letter that somehow the new government is responsible for the actions of the old government. I think we would reject that suggestion. We are committed to helping Honduras advance. We are committed to helping reintegrate Honduras into the OAS. We continue our discussions with countries in the region about how best to do this. We will continue our discussions with Honduras very respectfully, but very directly to help it improve its human rights performance. But we want to see Honduras rejoin the OAS and we’re actively working with other countries to see how that will take place. QUESTION: But you’re not looking to cut off assistance right now as they ask in the letter? MR. CROWLEY: No, as we indicated, we have restored assistance to Honduras in light of the election of the Lobo government. And we think our assistance is actually, directly connected to improving its ability to meet the needs of its people and also improving its human rights record at the same time. While I don't think that aid is the solution to Honduras' problems — in fact, I think that monetary aid acerbates Honduras' problems — I wonder how removing aid from the police and military will help them to investigate human rights violations, reduce the climate of insecurity and fear of crime that all Hondurans live in, and continue the fight against narcotrafficking which presumably benefits the US more than it does Honduras. Last year, 5,265 people were murdered in Honduras, putting Honduras at the top of the worldwide list among those countries who publicize their statistics until just recently when El Salvador's statistics were reported. Some very tiny percentage of those victims are claimed to be human rights violations. What about the other 5,2xx? Are they somehow less important because they didn't have political connections and weren't periodistas (journalists, though that word has a very loose definition in Honduras)? Isn't every murder a human rights violation? And just for the record, at the risk of sounding like a broken record: yes, there are human rights violations in Honduras; yes, there always have been and many were recorded during the Zelaya administration; yes, there are bad Honduran cops; and no, I don't believe the current Lobo administration is behind it or condones it or intentionally looks the other way. I think that the problem is more related to incompetence. What I would prefer to see rather than monetary aid is more outside investigative and prosecutorial training. If poorly written laws are a part of the problem, then I would like to see the laws reviewed and revised to ensure that criminals can be prosecuted and properly punished for their crimes because as it stands now, it doesn't seem that this is possible. There is a lot of misinformation about human rights violations being put out there from radical groups within and outside of Honduras looking to harm Honduras and impose a Chávez-style of government on it. The US Congress has its share of incompetence, too, in that they bow to the pressure from these groups without knowing the facts. I could not find the original letter. If anyone has a link to it, please let us know in the comments section. I would be interested to know which congressmen signed the letter. With elections coming up, you might be interested, too. Update: I found the letter on, of all places, the FRNP (Resistance) site. You can read the original here. Just as one example of the misinformation included in the Congressmen letter, they refer to the "rural workers", "the landless peasants" who merely "want to build a home" in the Bajo Aguan area. These "rural workers" have violently invaded private property, held it hostage for more than a year, attacked and killed security guards as well as other rural workers, prevented thousands of real rural workers from performing their jobs, stolen and sold African palm oil crops that took years to develop. When they were promised land grants of several thousand acres (by government expropriation of private property), they answered by stealing and occupying several more thousands of acres. Any thinking person might ask, how have these poor peasants obtained weapons and even supported their families for a year without working? Who is supporting them and where does the money come from? To make the story even worse, this same property was granted to the campesinos by the government back in the 1980's and they were even given agricultural training! Instead of building houses and making a go of the land, their corrupt leaders almost immediately sold the properties, bought big cars and held fantastic parties! So much for the downtrodden. Why work when through violence you can get a free hand out which can later be sold at a profit? The fact that the letter cites COFADEH as a "highly esteemed human rights organization" tells me everything I need to know. That may have been true 20 or 30 years ago, but under the leadership of Berta Oliva, this group is a bad joke! Some of the most outrageous lies have come from this so-called human rights group as well as CODEH, led by the crazy Andrés Pavón, whose lies are so enormous that even he can't keep a straight face when he tells them. Neither group has an ounce of credibility, something that the US State Department should know. 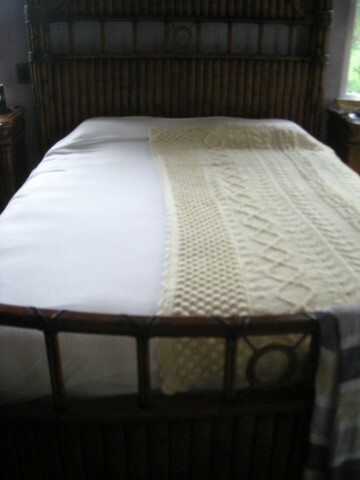 Guess which side of the bed is mine? The other day I posted on Facebook that I was freezing in La Ceiba. That prompted some comments of "Impossible!" and comparison to -2°C (28°F) Canadian weather (which always makes me feel so guilty). Of course I was exaggerating. It never freezes in La Ceiba or gets anywhere near close to it. Lower 60's °F (16°C) is the coldest that I've experienced and even that is rare. So how could I be "freezing"? It's not just in my mind, I swear it's not! My feet and hands and nose are cold to the touch. Even El Jefe who scoffs at my laments of being cold has to admit that I am cold when I put my icy hands on his neck. It's not just in my mind, really it's not! My chihuahuas agree. They will curl up in adjoining balls and their ears will be cold to the touch. 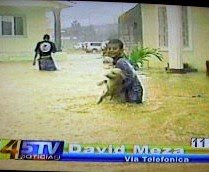 The first year that we were in Honduras, I used to laugh at the so-called 'cold fronts'. I told El Jefe that they should be called 'frentes tibias' (tepid fronts) not 'frentes frios' (cold fronts). I can remember wearing shorts or at most a light cotton jacket while I would see others wearing ski jackets, knit caps, and gloves. "These people don't know what cold is!" I thought. I never even unpacked my box of warm clothes the first couple of years. Now it seems that they are getting more and more use every year. I remember hearing some advice to new immigrants from a long time expatriate. After their first rainy season, the newbies mentioned that they were sending all their warm clothes home because they didn't need them. Long-timer Lori suggested that they hang on to them because "It will get colder". It's not that the weather actually will get colder, it's just that they will feel that it does ... eventually. So, what's the deal? Does your blood really thin in a warm climate? Anybody else get cold hands or a cold nose when the temperature is 70°F (21°C)? 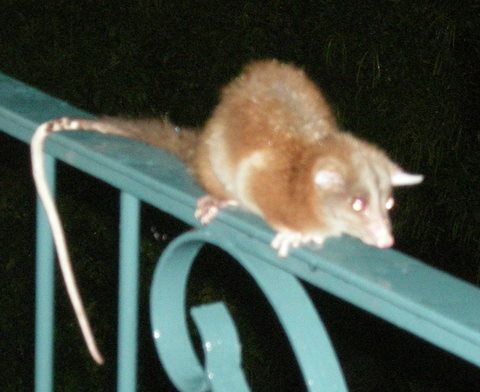 About 8:30 pm tonight, this animal was sitting on the railing on the upstairs terraza, barely 8 feet away from me. Chloe the guard dog was inside with me, off-duty because it was cold and rainy. She had been sound asleep on a pillow in the corner but we all (the dogs and I) heard a noise and she ran to the window to check it out. Thinking it was a branch falling in the wind, I went back to the computer. Several minutes later, I turned around and saw that Chloe was still standing at the window, staring outside into the dark, perfectly quiet and alert, her tail up, acting like a pointer dog. "What is it?" I took the two steps to the window, knowing that she couldn't possibly be seeing anything outside down below. "I don't see anything." I opened the screen to get a better look. "Eeeeek! 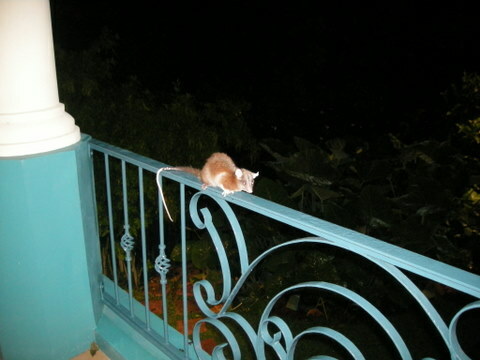 A giant rat!" I quickly closed the screen. Carefully peering through the screen again, I saw that it was too fluffy to be a rat. "No, it's that damn squirrel that takes one bite out of the guavas and then throws them to the ground!" "What's wrong with it? Why is it staying there looking at me? Why isn't it afraid? Why doesn't it run away?" Thoughts of deranged or rabid animals went through my head. Then the blogger in me recovered. I knew what I had to do. I got the camera and slowly opened the window enough to point the camera through the opening. Click! Flash! Still the animal didn't move. Click! Flash! It looked at me, turning its head from side to side. Every time Chloe or I made a noise, it moved its head and wiggled its ears as if it was using radar to pick up the sounds. In the flash of the camera, I could see that it was neither a rat nor a squirrel, but some sort of opossum. Bad news. As cute as this one looks, they kill chickens. You can see in this photo that it is looking down below, probably trying to decide which one of the birds he wanted for dinner. We had a close call a few nights earlier when something went after the chickens in the middle of the night but Chloe apparently scared it off before it could do its dastardly deed. After the peek through the open window, Chloe went nuts to try to get to the animal. She knows her job and it is to protect us and the chickens. She ripped right through the screen but I was able to hold her back long enough to close the window. 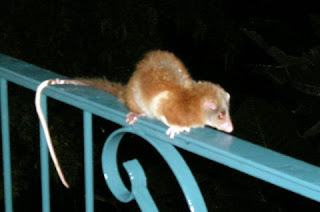 I wasn't so concerned to protect the animal as I was that if the animal jumped, Chloe, in her frenzy, would leap right over the railing to the ground below. What to do?! What to do?! It's El Jefe's job to handle wild animals, mice, and bugs! I took Chloe downstairs and let her outside to guard the chickens. Thankfully, minutes later our hero arrived. Chloe ran to the gate, whining "Come quick! There is an emergency!" J knew instantly that something was wrong. I ran to the other side of the terraza, whining, "J! There is an ANIMAL up here on the terraza!" "What kind of animal?" "I don't knooooow! Come up here! Hurry!" He took a look and I asked, "What kind of animal is it?" "It's one of those 'animals-that-eats-chickens'," as he always calls them. 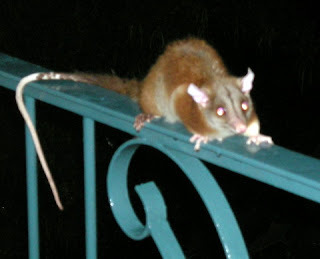 "I'm going to knock it off the railing so Chloe can kill it." "We have to kill it or it will kill the chickens," he patiently explained. "Oh, I know, but .... Oh, do what you have to do." So he did. And she did. He congratulated her for her good work. She felt useful. I felt terrible. Ugh. The law of the jungle is tough. Thanks to Laurie at Honduras Gumbo, I was reminded that today is the annual Blog Action Day. This year's topic is water. How could I have forgotten, coming from my own ordeal of 23 days without any running water? Water is a basic human right to which those in developed countries don't usually give a thought. Why should they? It's there. It's mostly clean. It's like the air that we breathe. When we want to flush the toilet, we do. When we want to wash our hands or the food that we will eat, we do. 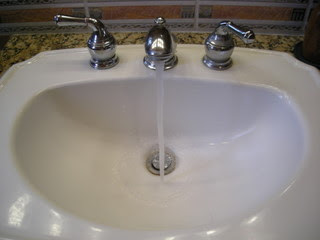 If we even want to be so bold as to get a drink straight out of the faucet, we can do that, too! Living in a third world country puts a whole different slant on the subject of water. Our attention is focused a lot more often on water. Where did it come from? Is it clean? Is it purified? What is the ice made from? Can I flush the toilet? When will the water be turned off or turned back on? When is the water delivery man coming? Was this food washed in purified water before it was served? And conversely, will my house or my crops or my church be flooded? All that and much more, even though we are, by average Honduran standards, relatively well off and live in a colonia that generally has water 24/7. We can afford purified water. We have a car and can go get water, purified and otherwise, when we need it. It wasn't until I started searching for photos for this article that I realized how frequently water has been a topic of this blog. Imagine the poor, who have no access to running water ever? Or those who can't afford a water holding tank or the (approximately) US $1 that a 5-gallon jug of purified water costs. Or the slightly better off who may have a faucet inside or outside their house, but who have no control over the filthy water that may come through it. Imagine those who have to choose between not bathing their child, or bathing him in water that will cause serious skin infections. Imagine those who store their water in uncovered buckets or pilas (concrete washing tubs, usually outdoors), even though they know this will attract mosquitoes which can result in being exposed to malaria or dengue. Not many people in Honduras are unaffected by water. At best, providing clean, reliable water has been and continues to be a big expense for their household. For the middle class, life with water rationing and less than good water quality is a way of life. Most common for the poor is a complete lack of running water of any quality. 1. No municipal or government provided water in Honduras is completely and consistently safe. This is because the water authorities in the communities use outdated or inadequate systems, or run out of money for the chemical treatments, forget to use the chemicals, or use too much or too little. The term 'potable water' has a different definition in Honduras. It seems to mean water coming through a faucet, not water 'fit for human consumption' like we tend to think in the US. 2. This one is hard to wrap your head around, but when there is rain — inundations of tropical rain measured in feet not inches! — there is often not more water available, but less. Why? Because most of the water in Honduras comes from rivers and when it rains, the rivers turn to mud (from man-made problems), so many water authorities have to turn off the water supply to prevent the filtering equipment from clogging up. And when there is no rain, there is insufficient water available because the rivers and creeks have dried up. Here in La Ceiba, we get an average of 3 meters of rain per year. That is almost 10 feet of rain! But many colonias have water rationing year round. 3. Most water associations, government or private, are not sustainable. They charge what neighbors can afford or are willing to pay rather than what it realistically costs to provide and maintain the water system. Thus, when something goes wrong (as it did in my neighborhood), there is no money for repairs. 4. This was the most shocking of all: Despite the critical and constant water rationing in Tegucigalpa, the average Tegucigalpa household uses more water than the average US household! Amazing, considering that, in general, homes and property lots are much smaller, there isn't much at all in the way of watering lawns or filling swimming pools, only the upper-middle to upper classes might have washing machines or dishwashers, and they don't have any running water at all a good bit of the time! I can't remember if this study was based on households with running water or on total households in the city. If the latter, that statistic is worse than ever. I believe that the reason for this anomaly is waste. First, the water installations are old and/or often poorly constructed even when new. 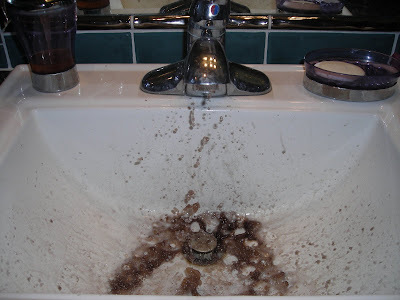 Probably a good percentage of the water seeps into the ground before ever arriving at the faucet. It's not at all unusual for water pipes to be above ground and to be able to see those leaks and the precious resource dripping or even spewing into the ground. Second, a lot of people living in areas where water is rationed have the habit of leaving the faucets turned on so that they will know when the water is available. If that lucky hour or two of water availability happens when they are at work or away from home, they want to have at least a bucketful of water when they get home — the rest goes down the drain. Despite the 'Cada gota cuenta!' (every drop counts) campaign, water conservation or preservation of water quality is just not something that most people feel responsible for. Education in this area is definitely needed before it is too late. We often wonder why Honduras hasn't advanced like some other countries with similar histories. Perhaps the lack of clean, running water should rank right up there with corruption? What is more basic to human life than water? When people are sick from the water, they can't work. When children are infested with parasites or skin problems, they can't learn. When children are needed to haul water from the creek instead of going to school, they aren't going to be successful, productive members of society when they grow up. Something to think about. If you or your organization is looking for a worthwhile project to help Honduras, you might consider looking in to what you can do to help the poor with water. Some groups have helped communities to organize and install water systems, and mostly importantly, to teach them how to effectively run them. Others provide the simple and inexpensive sand water filters that any household can use. If you are involved in such an organization in Honduras, please leave a comment with your website or email so people can contact you. Meanwhile, enjoy your water. Or if you want to experience how most of the world lives, turn yours off for a couple of days. It will be an eye-opening experience. 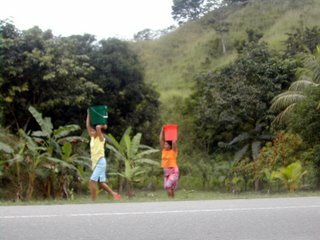 World Water Day is an article that I wrote in 2007 that discusses the multi-faceted problem of water in Honduras. I think you'll find it interesting. The photos used above are linked to the original articles. 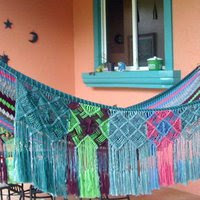 Honduras Gumbo: Check out Laurie's article from Tegucigalpa. See the background on Blog Action Day: Water at Change.org and links to many more articles written from across the world. After 23 days without, the water is flowing. I actually like these frijolitos (refried beans). They aren't bad at all and it's handy to have a package in the pantry for a quick meal. We always make our own beans, but since — I calmly mention — we have been without running water for 21 days, I haven't been inclined to do much cooking. (It's a good excuse anyway.) We've eaten a lot of baleadas. Not that I mind. I love baleadas and could eat them just about every day. A hot flour tortilla, a smear of beans, a little cheese and you're good to go. But, what were they thinking with that photo?! Spread the frijolitos on a tortilla, make a little pile on a plate with other food, show a happy face eating a baleada or burrito, anything would be better than this turd on a plate photo! I was working on my blog template and even though I wasn't doing anything with the reader comments section, all my Disqus comments flew away into the clouds to join my 13,000 lost Blogger comments! Oh, boohoo! So, not knowing anything else to do, I went to the Disqus site to try to figure out what the problem was. In looking at my settings, I noticed the "Import Blogger Comments" link and thought, "Oh, what the heck? Why not try it again for the 67th time?" Woohoo! It not only put my Disqus comments back on the Blogicito, it magically found all my old Blogger comments and posted them, too! I don't know if this is because Blogger changed its commenting system or Disqus changed something, but I'm so glad. I was really missing those old comments, especially when people ask the same things that were asked and answered before. There is nothing sadder than a lonely blog article with no reader comments. I love your comments, readers! Afraid of the traffic or afraid of the traffic police? On Monday, 13 members of the Honduran La Chicas Sambas band were killed in a traffic accident. 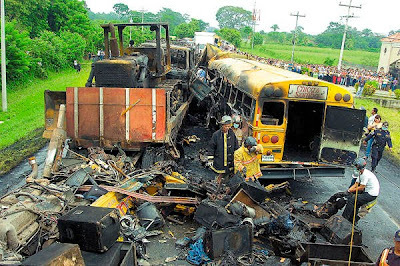 Weekly, if not daily, on the Honduran news, we see the mangled remains of horrendous beyond belief traffic accidents, in which an average of three people are killed per day. Often a bus or truck driver was drunk or otherwise impaired and usually traveling at a great rate of speed. Almost always cited as to blame is the poor condition of the truck or bus, such as the brakes or steering not functioning, or the recklessness of the drivers, such as speeding, passing on blind curves, and/or driving drunk. It is a common sight to see vehicles driving on the highway at night without tail lights or even headlights. As is normally done immediately after some particularly tragic accident, an announcement was made that bus inspections would be performed in Tegucigalpa starting October 15. What do the Honduran traffic police do? They harass and extort innocent citizens. That's pretty much it. Roadblocks in which drivers are hassled are the daily norm. In most areas, there are no vehicles or gas money to send the traffic police out to where they could actually do something to make the roads safer. Instead, as a team, they form roadblocks and stop cars to check paperwork, driver's licenses and auto registrations. Frequently, these checks are just an excuse to extort bribes, not just from those who appear to be able to afford it, but from the poor as well. One of the most common things is to say that the driver is in violation because their vehicle is not carrying 'triangles', those fluorescent markers that one might put on the street when a car breaks down. No matter that the vehicle doesn't have functioning brakes, lights, or turn signals. No matter that a truck may be so overloaded that the brakes won't work on the mountainous roads. Got your triangles? You're good to go. Don't have them? Put a little refresco money in the officer's pocket and you're good to go. Don't pay the bribe and your driver's license and possibly even your vehicle may be confiscated, depending upon the trumped up charge. We are told that we should report any bribery attempts or misconduct of the police. Hah! Sure, go ahead, if you want to be harassed, beaten up, arrested on a trumped up charge, or murdered. Often the top police officer in that location is fully involved in the misdeeds and/or gets his cut of the bribe money, or at a minimum, looks the other way at what the police under his command are doing. Complaints carry a name and address of the complainant and will probably never be addressed by the Fiscál anyway. We aren't talking about anything new or the occasional roadblock. El Jefe says that he gets stopped by the police virtually every single time he goes out, sometimes up to four times in the same day, and sometimes by the very same officers who have checked his license and registration three times already! The worst time, however, was one that gave me nightmares for weeks. El Jefe was coming home from a class about 9 p.m. He stopped for the police roadblock in a dark area on a deserted road. Tired and hungry, he made a comment something to the effect that they should be out looking for criminals instead of stopping innocent people and wasting their time. At that, the police told him to get out of the car, made him spread-eagle on the car — with guns drawn— while they searched him and the car. The officer in charge made jokes (?) to the other officers that they could easily take him out into the country and 'disappear' him. When you have a gun to your back, comments like that can only be taken seriously. Just before, J had pulled out his wallet to get his driver's license and had left it car. The officer who searched the car robbed him of his cash! Pretty terrible, you might be thinking. However, it gets worse. The same police officers showed up at our (isolated) house about 10 p.m. the following night! They hollered for El Jefe to come out. I begged him not to go out. I was terrified they would shoot or abduct him. He told me to stay inside and keep the doors locked, but instead I got the gun and went to the upstairs terraza to watch. To this day, I'm not entirely sure what their purpose was. El Jefe thinks that, based on where we live, they had second thoughts and were worried that we were 'important' people who would get them into trouble. They seemed to be trying to downplay what had happened the night before. I don't know about El Jefe, but I was thoroughly intimidated and didn't even consider my usual gringa stance of complaining about the injustice. 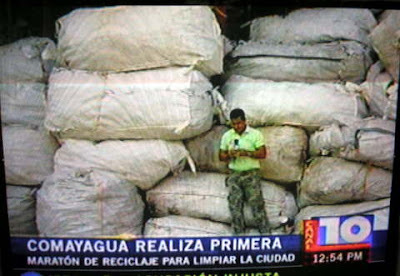 Oscar Alvaréz, Minister of Security, has been trying to purify the police department. He has made efforts to attract new recruits and focus on ethics and human rights in their training. More than 100 bad police officers have been fired and even arrested for crimes. Just yesterday, the jefe of Transit inspectors was arrested in San Pedro Sula for illegally releasing confiscated vehicles and bribery. In the past few months, we seem to be seeing some improvement in the professionalism and ethics of the police. They seem more polite, and El Jefe has only once been extorted for a bribe (which he did not pay). That was by a well-known alcoholic cop who feeds his habit with the money he extorts from honest citizens. While I believe that Minister Alvaréz is headed in the right direction, there is a long, long way to go. Corruption is so ingrained in the police department and as long as police cover up for each other, nothing will change. The following story was sent to me today by an American who runs a charitable group, a home for children. I have changed the names of the people involved and the location as their NGO status or their lives could literally be in danger if it was known that they complained. I, like you, am concerned about the direction of our beloved adopted country. This morning my Honduran wife María sent her brother José to [unnamed city] to pick up some food for the precious children in our care. He was stopped on main street, by a uniformed policeman, who asked to see his driving license. Then the officer demanded a 1,000 lempira bribe. When José told him that, if he had violated any law, he should be given a citation, which he would pay at the bank (the normal procedure in Honduras). He also told the policeman that it was a crime, under Honduras law, to ask for or pay a bribe. At that, the policeman dragged José out of my truck, with pistol drawn. It was feared that José would be murdered by the rogue cop. Two of our school teachers, three of our older children, and another man were with José, and heard and saw everything. Then José was handcuffed and thrown in the city jail nearby. When María and I were notified, we were outraged, and immediately drove to the police station in that town. Upon arrival, we learned that the report was true. José was jailed for, in effect, attempting to uphold the law of Honduras. I told the officer in charge that 1) I would not pay even one Lempira; and, 2) I demanded José's immediate release. You know the drill — we went around and around for an hour or two. The arresting officer lied rapidly. Our six witnesses all gave the true account of events. At last were told, "go home, and José will be released tomorrow." We replied that our group, which had grown by then, would leave only with José. I returned home with the intention of loading all of the children, including babies, on our bus, and take all of them to the station to wait for José's release. Before I could load all of them, María phoned, and reported that José had been freed. 1) How many Innocent people are in Honduras jails and prisons, because they do not have family or friends who support them? 2) What is the hope for the future of this beautiful country and people, when corruption is rampant in the system, or corruption is the system? That is why many Gringos, like you and I, are living here in our adopted country helping rear up a new generation who have respect for God, morals, and the rule of law. We won this round, but I was told to be careful, because the authorities may target me for reprisal. My response is that I have One with me who is more powerful than they. May God bless you, for your tireless efforts, for the future of Honduras. I pray the honest police in Honduras will police their own ranks. Perhaps your reports will reach the person or persons who will take up this needy cleansing. I believe that there are many honest people in law enforcement in Honduras. I gained a great respect last year, when they, and the brave military, stood in the streets and took much abuse from Mel's thugs in order to prevent mob rule in Honduras. I usually thank the officers, who stop me and check my license and registration, for their service to protect the public. Two things I can add to the original account. 1) María phoned the mayor of [town], who called the police station. 2) A friend of our family contacted someone in law enforcement in Tegus, and reported the incident. I think that person phoned the police in [town]. One, both, or neither may have impacted the decision to free José. I personally believe they did it to get rid of me, and our very vocal group. Human rights violations in Honduras? Sure. There always have been, and not, as the international media and Human Rights groups would have you believe, only against the Resistance. Politics have nothing to do with this. Bad cops are equal opportunity offenders. I don't believe this is a concerted effort on the part of the government — not this government, not the last one, and not the Zelaya or Maduro administrations before them. However, through neglect or lack of will or just plain incompetence, these sorts of things go on and on, and the final blame has to rest with the government for not effectively addressing the problems and prosecuting the criminal cops.